I just read this post on brave moms and brave kids. It was so right on. While there is a time to be protective and sheltering it is so important to let go (and be brave moms) so that our children can learn to be brave and learn to live a life for God! This post (part way down you get to the part about raising a family on one income) from Raising Olives was such an inspiration to me as I learn to be a better steward of what God gives me and to rely on Him more. I love the reminder of how very blessed we are and that so many things we have are truly luxuries. 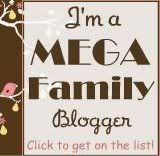 Here is another great one on Large Family Finances and living debt free. It really is about lifestyle and expectations. Following that thread I found this short sermon by Paul Washer very convicting and encouraging. Do you struggle with laundry? 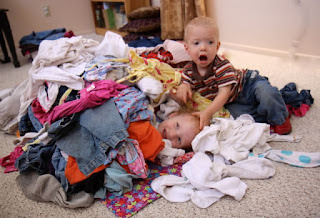 Have you lost small children under the piles in your home? I've posted about managing laundry before, check out this post too! Laundry is a never ending job in every home, but all the more so in a large family home. Our laundry and clothing management strategies have changed over the years, and there are so many ways to make it work. I'll share what is working for us right now, and I'd love to hear what you are doing too. -Cutting back on the clothing is a great first step in keeping the laundry under control. We make sure everyone has 2-3 sets of every day clothes as well as an "errand day outfit" (which also works as a back up for Sundays) and a Sunday outfit. This is really all they need along with the basics of socks, underwear and 2-3 sets of PJs. -Only wash what is dirty! Don't let your kids (or yourself) get in the habit of throwing clothes in the hamper just because they have been worn. Teach them to take a look at their clothes (and maybe a smell) to see if they really do need to be washed. 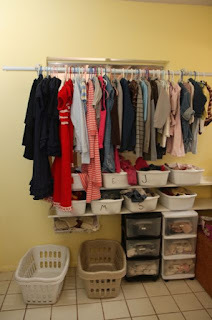 Teach the kids to hang up their Sunday/Errand day clothes as soon as they get home so they don't dirty them (this not only makes the laundry pile smaller, but cuts back on the ironing too!). -Schedule your laundry days. Using the above two steps you should have reduced the amount of laundry needing to be washed. Now just schedule two or three days to run a couple of loads of laundry. With everyone helping to start, move on, and then put away the laundry it will be a quick and easy job. You will still need to run some loads of sheets and towels (and maybe some cloth diapers too? We do! ), but that should be about it! -A family closet can help keep things organized and in one central location. I had always thought we would need a whole room for this, but with a little thought and creativity we've made this space in our laundry room work well for us. It also helps us remember not to bring too much into the home since we can see everyday that the space is limited. We may not do this long term, but for now it is working out well. That is what works for us. What works for you right now? 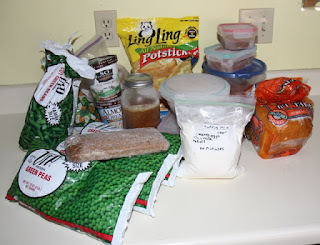 Time to clean out the pantry/refrigerator/freezer! The start of a new year is a good time to get a fresh start in the kitchen. 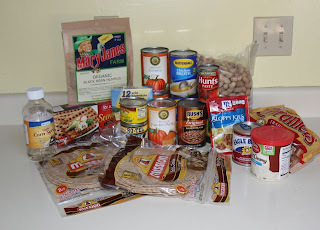 Doing a pantry challenge can help you de-clutter (get rid of the junk or odds and ends) and help get back to your budget (after it was busted with the holidays). The goal is to eat what you have and purchase as little as possible, this will require some creativity. I'd like to spend half of my regular budget this month. I'm not sure I can do it, but I'll give it a go. First I looked through my cupboards ignoring the recently purchased/staple items. I found quite a bit to work with. The black bean humus had sounded good, but I just never got to it, I think we will have it for lunch with some veggies. The bags of caramels will be turned into some yummy candy bars with the help of some other staples. I found a couple of packages of tortillas, it kind of scares me that they still seem to be good despite being purchased well over a month ago. I found several small containers of chili that were intended to be lunch for my hubby. :/ We will make a dinner out of them and some corn bread. A bag of pot stickers that should have gone with our Costco Chinese food was found, that will be a lunch. I had forgotten about the yummy Mozzarella and garlic sausages. It seems that we have a pea lover in the family (not me), but I'm always forgetting to get them out. We will work our way through them this month. 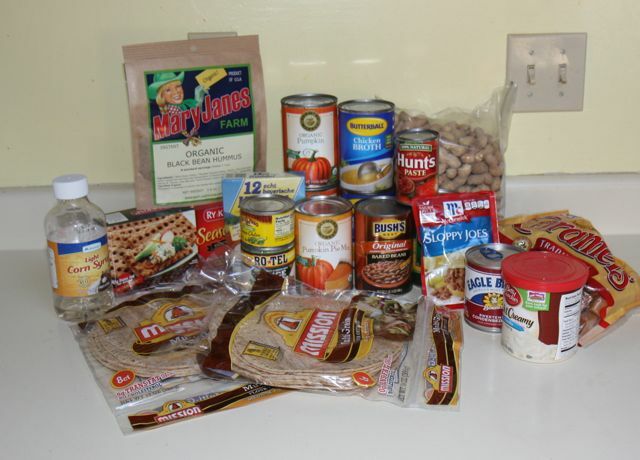 Are you going to do a pantry challenge too? If so, what sort of goal are you setting for this challenge? What did you find in your pantry? Anything of note? New year; its time to set some goals! 1. We've let lots of processed foods, sugar, and just plain junk (can we even call it food?) creep into our home over the past weeks and months. It's time to clean out and most importantly; not let any more in. 2. De-cluttering is a constant goal/battle. As a family we are going to work on being very mindful of what we are bringing into our home, as well as getting things out that are already in our home. 3. I've been slack in managing our finances, not being a good steward of what we have been given. I need to have better self-control and be wiser in where/how I'm shopping. These are things I know to do, but application is a whole other matter. 4. Unfinished (or not even started) projects abound around here. I hope to enlist the kids in working on some of these things and not starting new ones unless absolutely necessary. 5. The goal is that we would not have so much stuff cluttering up our lives requiring our time and attention so that we may better focus on the relationships in our lives. To be spending more time studying God's word, applying His word, and serving one another in love. As I go along working on these things I'll try to give some updates and let you know how I'm doing (and maybe encourage you along the way too?). How about you? What goals are you setting? What areas do you need to work on? How are you going to go about accomplishing these goals?